What is a home without a mother in it? It is nothing but an empty shell. It is sterile and has no atmosphere. When mother is not in the home the children, of necessity, will be elsewhere, but not with their mother. The home needs a mother and true mothers need homes. Homes and mothers are synonymous terms. Some women have taken the plunge to come home, but have found it difficult because of negative pressures. A husband who does not have strong convictions on this subject is one of the main culprits. Even if he does have strong convictions, but does not know how to encourage his wife to be happy at home, he can easily loose his wife back to the corporate world. 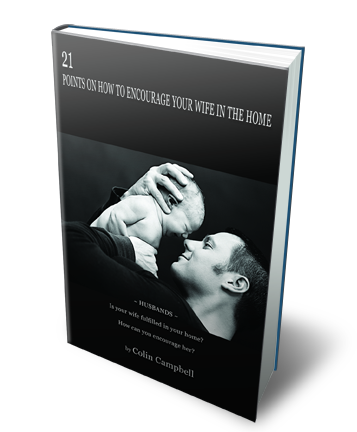 This ebook contains 21 suggestions on how to encourage your wife in the home. 21 Way To Encourage Your Wife In The Home TODAY! Order your Electronic Book (E-book) file(s) today. Examine the contents for a full 30 days. If after examining the ebook you feel that this material is defective, call us and tell us you’d like to receive a replacement E-book file. My husband heard Colin speak in Nashville and was very inspired! He came home and planted a garden for me! He also started taking the laundry upstairs for me! He kept asking me to locate the 21 points Colin spoke on. So we were very excited to see this offered as an ebook! I love above rubies and probably wouldn't have my last 6 children if God hadn't put above rubies in my path!!! Great booklet for new and old married men. Excellent advice from a biblical perspective on how to bless your wife. Study and follow these precepts with your whole heart and you will receive new life in your marriage. I got this for my Korean husband even though he may never read it (English is still difficult for him)thinking that I could learn what to ask of him as time goes by. It's small; just 11 pages. There are some grammatical errors and it's a little repetitive in its theme. However, despite this I really like it and will probably read it again and again for its valuable points. Click the button below to add the 21 Ways To Encourage Your Wife In The Home - E-Booklet to your wish list.